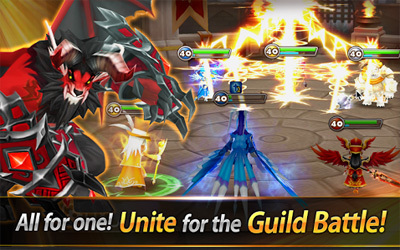 Summoners War APK is one type of mobile battle games and now the latest version is 3.7.5. Based on its title, this game seems to be very interesting. It claims to offer amazing graphics as well as huge collection of around hundreds monsters. However, those qualities cannot really impress all of people to play this game since it has been known that most of the stuff in the game is not quite fun to play. There are some good points and weaknesses that perhaps can help you determine before you actually play with this. This game provides remarkable beginnings by presenting a nice basic tutorial for the players. You will be explained on how to collect the monsters, increase their power, and how to buy the buildings. However, if you have tried the real combat, you commonly will feel impressed since all the battles are showed in 3D. Moreover, the monster will obtain cut scenes whenever it does critical assaults.